The Foundation for Landscape Studies is pleased to announce the awardees of the 2016 John Brinckerhoff Jackson Book Prize for recently published books that have made significant contributions to the study and understanding of garden history and landscape studies. The recipients are listed in alphabetical order. Beyond the dense urbanism of Mumbai (Bombay) or the IT centers of Bangalore and Hyderabad lies the Ganges River basin – today home to over one-quarter of India's billion-plus population – a space historically defined by a mythological constellation of terrestrial sites imbued with mythological, celestial significance. Not only is it one of the most densely populated river basins in the world but it also undergoes dramatic physical changes with the onslaught of the wet monsoon, when over one meter of rain falls in the span of three months. 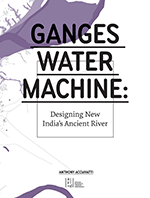 Focusing on the intersection of these two observations, this book is an atlas of built and unbuilt projects designed to transform the river into a hydrological system best described as a supersurface: a surface engineered at every level, from the scale of the soil to the scale of the nation. Anthony Acciavatti, architect and principal of Somatic-Collaborative in New York City, is currently pursuing a Ph.D. in the History of Science Program in the Department of History at Princeton University. 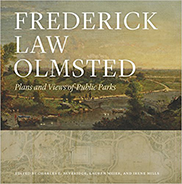 With more than 470 images, of which 129 are in color – Frederick Law Olmsted: Plans and Views of Public Parks portrays seventy landscapes, including parks, parkways, park systems, and scenic reservations, designed by the father of landscape architecture in America. Sketches, studies, lithographs, paintings, historical photographs, and written descriptions provide tours of such notable landscapes as Central Park, Prospect Park, the Buffalo Park and Parkway System, Washington Park and Jackson Park in Chicago, Boston’s "Emerald Necklace," and Mount Royal in Montreal, Quebec. Charles E. Beveridge, professor emeritus at American University, is series editor of The Papers of Frederick Law Olmsted and author of Frederick Law Olmsted: Designing the American Landscape. Lauren Meier, a landscape architect specializing in historic preservation practice, is coeditor of The Master List of Design Projects of the Olmsted Firm 1857-1979. Irene Mills, a former military officer with master’s degrees in electrical engineering and landscape architecture, helped produce the George Washington Parkway Cultural Landscape Report for the National Park Service. Gardens are immobile, literally rooted in the earth, but they are also shaped by migration and by the transnational movement of ideas, practices, plants, and seeds. In Paradise Transplanted, Pierrette Hondagneu-Sotelo reveals how successive conquests and diverse migrations have created Southern California gardens, and in turn how gardens influence social inequality, work, leisure, status, and the experience of nature and community. Drawing on historical archival research, ethnography, and over one hundred interviews with a wide range of people including suburban homeowners, paid Mexican immigrant gardeners, botanical garden professionals, and immigrant community gardeners in inner-city Los Angeles, this book offers insights into the ways that diverse global migrations and garden landscapes shape society. Pierrette Hondagneu-Sotelo is a professor in the Department of Sociology at the University of Southern California, where she also serves as associate director of the Center for the Study of Immigrant Integration. 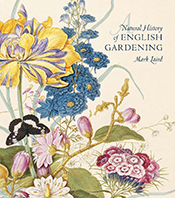 Inspired by the pioneering naturalist Gilbert White, who viewed natural history as the common study of cultural and natural communities, Mark Laird unearths forgotten historical data to reveal the complex visual cultures of early modern gardening. Ranging from climate studies to the study of a butterfly’s life cycle, he examines the scientific quest for order in nature as an offshoot of ordering the garden and field. In doing so, he follows a broad series of chronological events to probe the nature of gardening and husbandry, the role of amateurs in scientific disciplines, and the contribution of women as gardener-naturalists. Illustrated by a wealth of visual and literary materials – paintings, engravings, poetry, essays, and letters, as well as prosaic household accounts and nursery bills – Laird fundamentally transforms our understanding of the English landscape garden as an expression of cultural history. Mark Laird is a historic landscape consultant and garden conservator and teaches landscape history at the Graduate School of Design, Harvard University. That Ireland is picturesque is a well-worn cliché, but little is understood of how this perception was created, painted, and manipulated during the long 18th eighteenth century. This book positions Ireland at the core of the Picturesque's development and argues for a far greater degree of Irish influence on the course of European landscape theory and design. Positioned off-axis from the greater force-field, and off-shore from mainland Europe and America, where better to cultivate the oblique perspective? 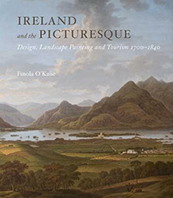 This book charts the creation of picturesque Ireland while also exploring in detail the role and reach of landscape painting in the planning, publishing, landscaping, and design of Ireland's historic landscapes, towns, and tourist routes. Thus it is also a history of the physical shaping of Ireland as a tourist destination, one of the earliest, most calculated, and most successful in the world. Finola O’Kane is a lecturer in the School of Architecture, Landscape and Civil Engineering, University College Dublin. Robert Riley has been a renowned figure in landscape studies for over fifty years, valued for his perceptive, learned, and highly entertaining articles, reviews, and essays. Many of Riley's essays were originally published in Landscape, the magazine founded by John Brinckerhoff Jackson, for which Riley subsequently served as editor. The Camaro in the Pasture is the first book to collect this compelling author’s writing. With diverse topics ranging from science-fiction fantasies to problems of academic design research, the essays in this volume cover an entire half-century of Riley’s observations on the American landscape. The essays – several of which are new or previously unpublished – interpret changing rationales for urban beautification, the evolution and transformation of the strip, the development of a global landscape of golf and resorts replacing that replaced an older search for exoticism, and the vernacular landscape as wallpaper rather than quilt. Ultimately, Riley envisions our future landscape as a rapidly fluctuating electronic net draped over the more slowly changing and familiar land- and building-based system. Throughout, Riley emphasizes the vernacular landscape of contemporary America – how we have shaped and use it, what it is becoming, and, above all, how we experience it. Robert B. Riley, Professor Emeritus of Landscape Architecture and Architecture at the University of Illinois at Urbana-Champaign, is coeditor, with Terence Young, of Theme Park Landscapes: Antecedents and Variations. John Nolen (1869–1937) was the first American to identify himself exclusively as a town and city planner. In 1903, at the age of thirty-four, he enrolled in the new Harvard University program in landscape architecture, studying under Frederick Law Olmsted Jr. and Arthur Shurcliff. Two years later, he opened his own office in Harvard Square. Over the course of his career, Nolen and his firm completed more than four hundred projects, including comprehensive plans for more than twenty-five cities, across the United States. Like other progressive reformers of his era, Nolen looked to Europe for models to structure the rapid urbanization defining modern life into more efficient and livable form. His books, including New Towns for Old: Achievements in Civic Improvement in Some American Small Towns and Neighborhoods, promoted the new practice of city planning and were widely influential. 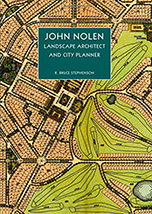 In this insightful biography, R. Bruce Stephenson analyzes the details of Nolen's many experiments, illuminating the planning principles he used in laying out communities from Mariemont, Ohio, to Venice, Florida. Stephenson concludes by discussing the potential of Nolen's work as a model of a sustainable vision relevant to American civic culture today. Bruce Stephenson, Ph.D., has worked as a public planner, consultant, and professor. His research and teaching focus on the intersection of regional planning, environmental protection, and urbanism. He has written three books and more than forty editorials in a range of professional journals. His latest book, John Nolen, Urban Planner, Landscape Architect and City Planner, informed his consultancy for the Winter Park SunRail Station and the Genius Preserve and earned the 1000 Friends of Florida Community Betterment Award. The largest and most pervasive of human artifacts, landscapes are both cultural expressions and environments that shape our actions. Playgrounds, cemeteries, memorials, historic sites, public squares, gardens, industrial rehabilitation sites, wild national parks, and manicured urban parks provide the settings for work, recreation, commerce, memorialization, and mourning and shape the experience and meaning of these activities in Canada. 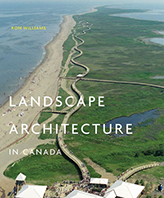 In the first critical history of designed landscapes in that country, Ron Williams approaches landscape architecture as a social art that creates places for people to use and as an environmental art through which practitioners act as stewards of the natural world. Ron Williams, formerly a longtime longtime professor and former director of the School of Landscape Architecture at the Université de Montréal, is a practising architect and landscape architect.